Residents of Bugesera district paid tribute to victims of the 1994 genocide against Tutsi and gave a decent burial to more 165 victims at Ntarama Genocide Memorial. According to Mutabazi Richard the district Mayor Mayor the majority of the bodies have been recovered from one place in Nyamata Hospital. Currently Rwandans are engaged in activities for the 25th commemoration of the genocide against Tutsi which claimed a million lives. The Genocide was systematically planned and executed in a period of 100 days from April to July in 1994. 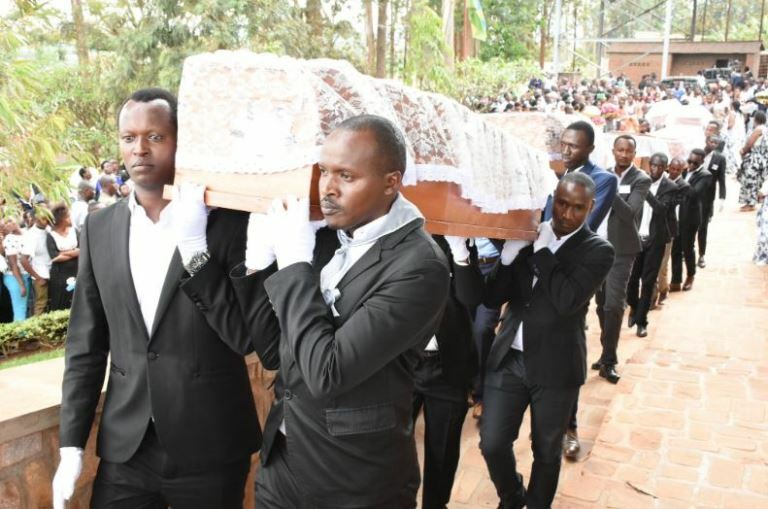 The burial was presided over by Minister of Justice, Busingye Johnston, Governor, Eastern Province, Archbishop of the Kigali Archdiocese, His Grace Antoine Kambanda, Executive Secretary ofCNLG Jean Damascène Bizimana, Security organs among others. Hours after the plane carrying president Juvenal Habyarimana was brought down, the following day on 7th April, Tutsi homes were set ablaze in Ntarama, with some resistance from local farmers. The Tutsi escaped to Ntarama Church believing they would be safe because during previous violent episodes, religious sites had been respected by the attackers. However, later on 13th April, Interahamwe militia under the leadership of Francois Karera, the former leader of the prefecture, conducted a census of the Tutsis at the Ntarama Church. They told the Tutsis that they wanted them to stay together so that the government could guarantee their security. On 15th April, soldiers and Interahamwe militia returned to Nyamata Church and began a coordinated and systematic attack against approximately 5,000 Tutsi who were in the Ntarama church compound. The Church of Ntarama was turned into a genocide memorial site to remember the 5,000 people who lost their lives there. This site is of particular national significance and the human remains, clothing and artifacts taken by those killed in the church remain on display at the site.